Wind farms around the world are large and getting larger. Arranging thousands of wind turbines across many miles of land requires new tools that can balance cost and efficiency to provide the most energy for the buck. Charles Meneveau, who studies fluid dynamics at Johns Hopkins University, and his collaborator Johan Meyers from Leuven University in Belgium, have developed a model to calculate the optimal spacing of turbines for the very large wind farms of the future. They presented their work at the American Physical Society Division of Fluid Dynamics (DFD) meeting in Long Beach, CA. "The optimal spacing between individual wind turbines is actually a little farther apart than what people use these days," said Meneveau. The blades of a turbine distort wind, creating eddies of turbulence that can affect other wind turbines farther downwind. Most previous studies have used computer models to calculate the wake effect of one individual turbine on another. 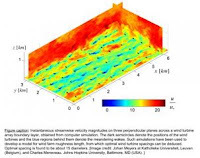 Starting with large-scale computer simulations and small-scale experiments in a wind tunnel, Meneveau's model considers the cumulative effects of hundreds or thousands of turbines interacting with the atmosphere. "There's relatively little knowledge about what happens when you put lots of these together," said Meneveau. The energy a large wind farm can produce, he and his coworkers discovered, depends less on horizontal winds and more on entraining strong winds from higher in the atmosphere. A 100-meter turbine in a large wind farm must harness energy drawn from the atmospheric boundary layer thousands of feet up. In the right configuration, lots of turbines essentially change the roughness of the land -- much in the same way that trees do -- and create turbulence. Turbulence, in this case, isn't a bad thing. It mixes the air and helps to pull down kinetic energy from above. Using as example 5 megawatt-rated machines and some reasonable economic figures, Meneveau calculates that the optimal spacing between turbines should be about 15 rotor diameters instead of the currently prevalent figure of 7 rotor diameters. Five related species of tree-dwelling snakes found in Southeast and South Asia may just be the worst nightmares of ophidiophobes (people who have abnormal fears of snakes). Not only are they snakes, but they can "fly" -- flinging themselves off their perches, flattening their bodies, and gliding from tree to tree or to the ground. To Virginia Tech biologist Jake Socha, these curious reptiles are something of a biomechanical wonder. 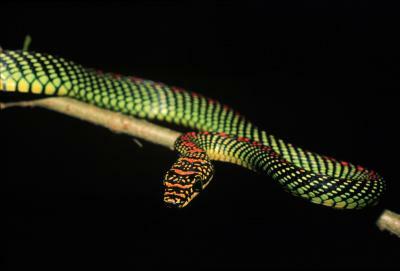 In order to understand how they do what they do, Socha and his colleagues recently studied Chrysopelea paradisi snakes as they launched themselves off a branch at the top of a 15-meter-tall tower. Four cameras recorded the curious snakes as they glided. This allowed them to create and analyze 3-D reconstructions of the animals' body positions during flight -- work that Socha presented at the American Physical Society Division of Fluid Dynamics (DFD) meeting in Long Beach, CA. The reconstructions were coupled with an analytical model of gliding dynamics and the forces acting on the snakes' bodies. The analyses revealed that the reptiles, despite traveling up to 24 meters from the launch platform, never achieved an "equilibrium gliding" state -- one in which the forces generated by their undulating bodies exactly counteract the force pulling the animals down, causing them to move with constant velocity, at a constant angle from the horizon. Nor did the snakes simply drop to the ground. Instead, Socha says, "the snake is pushed upward -- even though it is moving downward -- because the upward component of the aerodynamic force is greater than the snake's weight." "Hypothetically, this means that if the snake continued on like this, it would eventually be moving upward in the air -- quite an impressive feat for a snake," he says. But our modeling suggests that the effect is only temporary, and eventually "the snake hits the ground to end the glide."